Annette Dasch (soprano); Mihoko Fujimura (mezzo); Piotr Beczala (tenor); Georg Zeppenfeld (bass); Wiener Singverein/Johannes Prinz. It is clear to me that anyone who accuses Thielemann of being a dull in this Beethoven cycle has either not listened to the Allegro con brio of the first movement of the Second Symphony, or not listened properly, or has no ears to hear. To get the proper measure of this set, start there. It is one of the most joyous, released and sheerly infectious accounts I have ever heard, full of drive, impish wit and manic ecstasy. The orchestra is obviously having a high old time. As the DVD amply illustrates, they love playing for Thielemann and are clearly of the opinion that anyone who wants etiolated string-tone, vibrato-free whining and clipped phrasing can go and stick his head in a bucket. The fiddles of the Vienna Philharmonic slither around like a greased porker at a hog roast before easing into the ensuing Larghetto with the utmost suavity. It is equally apparent that the paying public seated in the splendidly named Goldener Saal der Gesellschaft der Musikfreunde knows what it wants to hear, too - and they got it in this series of the complete symphonies recorded in numerical sequence between December 2008 and April 2010. I find it scandalously incomprehensible that the music critic of a major broadsheet should recently have complained that the clarity of these live recordings only serves to highlight the inadequacy of the VPO and then continued by questioning its status as one of the world's best orchestras. " He is clearly in thrall to an entirely different musical aesthetic from the conductor, the orchestra, the audience and all those who have greeted these performances so enthusiastically. We really are at a cultural crossroads if such a glorious interpretation may be derided with impunity by a major commentator. Yet as the interviews in the accompanying DVD demonstrate, Thielemann is no recidivist dinosaur. He explains that he seeks to find an artistic direction which synthesises the virtues of the HIP movement with the Viennese tradition of interpreting Beethoven. He is thus, in a sense, an open-minded conservative. He rightly points out that by all accounts Beethoven wasn’t a very good conductor, certainly never had at his disposal an orchestra like the VPO and was clearly unreliable when it came to those contentious metronome markings. It might well be that convicted HIPsters, on listening to these accounts, will conclude that Thielemann was only paying lip-service to the tenets of their creed but I am in no doubt regarding the sincerity of the conductor, his orchestra and his producers in their desire to honour Beethoven. So we certainly hear something which is much more indebted to the legacy of Karajan, Cluytens and Klemperer than to Norrington, Goodman or Hogwood, but there is a vibrancy, energy and freedom to Thielemann’s which convey a special joie de vivre. Again, the rehearsal clips on the DVD confirm what an acute ear he has for sonic nuance, tonal balance and subtle phrasing; he is especially good at bringing out the lower voices and his agogic finessing, while not as overt or audacious as the now vanished manner of Furtwängler, ensures an extraordinarily satisfying result. Nor are these performances by any means abnormally slow or marmoreal. 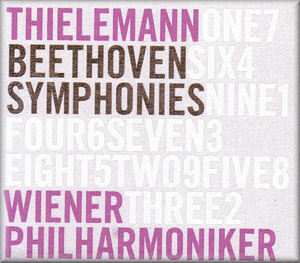 To take a random sample from the middle period symphonies, comparing Thielemann’s speeds with those of previous recordings from the canon of the accepted greats, we find that Thielemann is only as slow as Kleiber in the Allegro of the Fifth, virtually identical to Maag and Cluytens in the Sixth - except Cluytens doesn’t make the repeats in the first movement - takes the Presto in the Seventh faster than Kubelik, Maag, Casals and Kleiber and maintains tempi in the Eighth virtually identical to those of Maag and Cluytens. It is true that HIP conductors are generally faster but one might equally point to Toscanini for an example of thrilling, driven propulsiveness, whereas such as Mackerras sound merely hasty. And there are times when you can hear Thielemann giving almost undue emphasis to the downbeat in every bar, so very few of the generalised accusations hold up under scrutiny. One disgruntled reviewer elsewhere complains that Thielemann’s beat in the first movement of the Eroica is excessively slow yet has failed to acknowledge that he actually makes the exposition repeat unlike the supposedly superior version with which he is making comparisons supposedly invidious to Thielemann. It is another, different and possibly valid argument to object that taking the repeat unnecessarily prolongs and mars the progression of the movement, but for the most part too many carpers are hearing what they want to hear instead of examining the facts. For me, Thielemann’s Beethoven sounds consistently fresh and exploratory infused with a genuine desire to rediscover the music as it is being played. This is a set ideally conceived to drive the wedge deeper between those who want the breathless, bright-eyed sparkiness of, say, Mackerras, and those who welcome what they regard as a return to sanity in the form of the great Romantic tradition of Beethoven interpretation. Thielemann plays to his clientele’s tastes – not to mention his own and those of his orchestra. As the second essay in the booklet explains, the VPO’s credentials for claiming “authenticity” in their style of Beethoven playing could hardly be stronger, for all that the “authenticists” excoriate their vibrato and ripe sound. The orchestra was specifically formed to play Beethoven and has done so since its first performance of the Seventh on Easter Monday 1842. Thielemann takes the orchestra’s famed sonority and builds on it. These are performances all of a piece; Thielemann has imposed his conception upon the cycle as a whole and the emphasis upon weight and grandeur without excluding excitement. The Pastoral is typifies his approach: warm, lyrical and gently bucolic, redolent of a wise humanism closest to Cluytens rather than the bracing account Karajan delivers in his Moscow performance, yet the peasants’ knees-up is sprightly and the storm powerful without ever becoming vulgar – and it builds to a terrific climax. The Fourth is as fine a reading as I have ever heard: the “cat-like tread” of its opening giving promise of a performance which ideally combines rigorous control with thrilling moments of release, especially in the finale. The Third and Fifth are monumental, although Thielemann pulls the tempo about daringly in the first movement of the Eroica and the finale of the Fifth. The Seventh and Eighth are similarly grand in the Klemperer mode. Perhaps predictably, I found the Ninth the least satisfactory, mainly because of the strength of competition and the difficulty in finding modern soloists up to its vocal challenges. Having said that, it’s really only the final movement that slightly disappoints: the soprano is the weak link, being rather wobbly and screaming her top B insecurely. Tenor Piotr Beczala has trouble finding the right pitch for his first entry on “Froh” and never sounds very comfortable but is adequate, as is the ever-restrained Fujimura. Georg Zeppenfeld is more baritone than bass but he has a firm, focused voice and declaims dramatically. The Singverein are lusty and committed, their penetration and intonation excellent. Otherwise, the other movements are titanic and I very much like the way Thielemann engineers a rallentando each time before the entry of the Ode, thereby generating real climactic punch. The recording quality is superb, although the wide dynamic range and Thielemann’s insistence upon real pianissimos that undoubtedly carried in the hall present challenges to the engineers and hi-fi equipment. There is very little audience noise – the occasional cough but nothing disturbing and in quality this recording can stand comparison with any. The brass and hard-edged timpani come across with amazing clarity and immediacy but as I remarked earlier, the listener is always aware of the bottom-line harmonies. The packaging is de luxe: a handsome, off-white cloth-bound case and booklet, with white, purple and gold-stamped, embossed lettering, which has the unfortunate side-effect of making small-font information such as the catalogue number impossible to read. There are rather too many arty, hagiographic photographs of Thielemann reminiscent of the Karajan cult, and excellent essays on “Beethoven’s Symphonies in an Age of Revolution” by author Tim Blanning and “Beethoven and the Formation of the Vienna Philharmonic” by Prof. Dr. Clemens Hellsberg, first violinist and president of the orchestra. The discs are contained in cardboard sleeves bound into the booklet. The voice-overs on the DVD documentary work well, except I wish someone had corrected the pronunciation of “timbre” so that it rhymes with “clamber” rather than perpetrating the solecism “tombre”. You probably already know by now whether you are susceptible to the more Olympian interpretative stance adopted here by Thielemann and could hardly complain if you bought them expecting something more lean and lithe of the kind attempted – rather disastrously in my view – by Rattle with the same, I suspect, unwilling, orchestra in 2002. Thielemann has been quoted as seeking “to restore to the Classical and Romantic repertory the sort of musical riches and unprecedented expressivity that we associate with a conductor like Wilhelm Furtwängler”. In my judgement, he succeeds admirably without necessarily abandoning some of the lessons period practice has taught over the last thirty years; this is indeed “Beethoven for the Twenty First Century”.